It is often difficult to apply the term “quintessentially English” to a rural inn as rustic vernacular architecture differs so greatly between counties and regions. But for the 16th century Bull at Sonning-on-Thames we can be forgiven for using the description (even if there are plenty of other lovely old pubs in the area that are equally deserving). 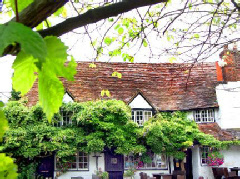 “Sonning is the most fairylike little nook on the whole river. If you stop at Sonning, put up at The Bull, behind the Church. It is a veritable picture of an English country inn"
Today, The Bull offers 7 guest rooms, some of which feature the fine old beams that form the structure of the building. It also houses a restaurant and its bar is as popular with locals as visitors alike. Reading, Pangbourne and Henley-on-Thames are all within easy reach by car, while access to London is easily achieved via the nearby M4 - a fact you might forget given the charming village location of this celebrated old pub. Reviews and Booking. Please note that nightsinthepast.com plays no part in the actual review, booking or reservation process for The Bull Inn or any other accommodation. Costs for maintaining and developing Nights in the Past are met solely by it being the last referring site to our partners which results in a completed reservation.